This security poster illustrates the TMM Yugoslavian Anti-Tank Mine. This mine is a direct copy of a German WW2 anti-tank mine. The anti-tank mine’s body is fitted with anti-lift and side mounted fuze well. This security poster features the TMM Yugoslavian anti-tank mine’s specifications, fuze, and operation, a sectioned TMM-1 showing the UMP-1 pull fuze in the side booby trap well and the closure plug in the bottom well, a TMM-1 mine without pressure plate, and the UTMM-1 fuze with rubber cap. This security poster also shows illustrations and descriptions on how to disarm the TMM Yugoslavian anti-tank mine. TMM-1 sectioned showing the UMP-1 pull fuze in the side booby trap well and the closure plug in the bottom well. TMM-1 mine without pressure plate. Illustrations and descriptions on how to disarm the TMM Yugoslavian anti-tank mine. The TMM Yugoslavian anti-tank mine’s specifications, fuze, and operation. 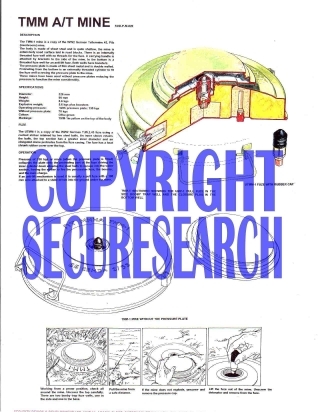 This security poster features the mine's specifications, fuze, and operation, illustrations and descriptions on how to disarm the mine, a sectioned TMM-1, a TMM-1 mine without pressure plate, and the UTMM-1 fuze with rubber cap.